When one of my favorite restaurants was closed on an early Saturday afternoon, I had no choice but to find another place to satisfy my hunger. At the suggestion of my wife, we decided to take a trip to Slab – the relatively new eatery that became of the separation between Micucci Grocery and the longtime creator of their famous pizza. 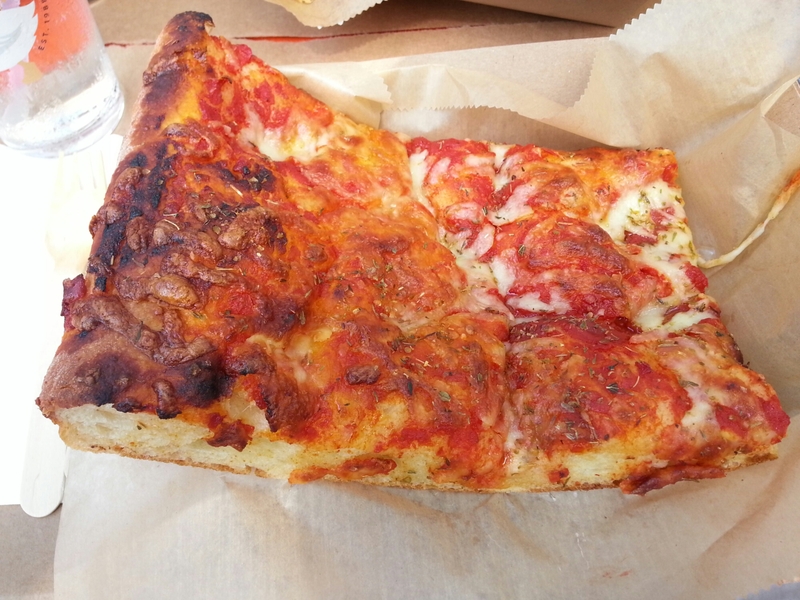 I had seen the “Sicilian Slab” and heard lots about it, but I had never actually had one. On the occasions I was at Micicci’s and there was actually a slice available, there was only one, so it was clearly popular. In truth though, I wasn’t that pumped about it. I really don’t like cheese pizza; I find it plain and boring, but as a man of the people, I still had to see what it was about. As we walked in, the hostess approached us and we decided to request outdoor seating. On the way to the open air, I looked around the restaurant like a melancholy cow with a certain curiosity. It had a great bar and felt very comfortable. It wasn’t overly busy, presumably due to the time of day, but there was a small crowd. The outdoor seating area was huge and filled with lots of orange tables and benches. A band was getting ready to play and a heavy breeze was flying by. The hostess left us with menus. The menu had a sufficient number of options, but was relatively simple and concise. The rear of the menu listed the libations and specials. The drink menu was extensive with many draft options, several cocktails, and a bunch of wines. When the waitress came to our table, she welcomed us to the restaurant and we ordered drinks. I chose a Hidden Cove Pecan Barrel Aged Porter – a bourbon barrel aged imperial porter. My wife forgot who she was and ordered a beer – Uinta Sum’r organic summer ale. We waited for our drinks and the band started playing some bluesy tunes. While bobbing our heads, we looked seriously at the menu. Even though it wasn’t that large, there were a number of items that looked good to me, so I had trouble deciding what I wanted. After much contemplation and with my distaste for cheese pizza in mind, I decided on The Hand Slab – a 1 lb. beast with homestyle tomato, mozzarella, and provolone. Then I went with a Spicy Meat Wedge – pepperoni, peperoncini, red pepper sauce, and cheeses. I figured the wedge was a sure thing which would go well with my long shot wager on the slab. Mrs. Portlandeater went with The Slaw – crisp shaved Sicilian salad with a sweet-tangy lime anise vinaigrette – and also threw in a hand slab for good measure. Shortly after deciding on our food, our beers came out and we placed the orders. I sipped mine. It was very strong at 10% ABV and had a distinct bourbon flavor with a full-figured body. I liked it quite a bit. I tried my wife’s beer too. It was very light and tasty. The sun was out, the band was playing, and I was sipping a killer beer. We were off to a good start. Now the wait for our chow was on. While we were waiting, the waitress wandered over with a tray of silverware, napkins, salt and pepper, red pepper flakes, and grated cheese. The forks and knives were wooden which definitely verified the menu’s assertion that Slab was a “biodegradable and recyclable restaurant”. It was pretty cool, though I was a little concerned about eating with wooden tools. Our slaw was delivered. She dug into it first and loved it. I tried a bite. It was very colorful and pretty damn good except that I don’t really enjoy fennel which was present in moderate quantities. Other than that though, it was great. Light and refreshing with a very delicious dousing of delicate dressing, it was really a perfect summer starter. I must say that the wooden fork was a little strange to eat with, but it worked. We ate the slaw and got ready for the “Pizze” as the menu called it. After a reasonable wait, our pizza came out. The slabs were indeed monstrous. The wedge was somewhat smaller, but nothing to shake a stick at. I eyed the slab to eat first. The “crust” was not typical; it might have been a Calabrese bread based on my research. It was thick and very bread-y. The sauce and cheese appeared pretty sparse. I could see and smell some spices sprinkled on top. The pizza seemed to be well-cooked which was good. It was time to taste it, but it really didn’t seem like something I would enjoy. I took a bite of the pizza and immediately requested forgiveness for my insolence. I was totally wrong about it. The delicious bread with sweet red sauce, cheese, and a strong helping of spices was magical. For extra “oomph” I added some red pepper and grated cheese, but it didn’t need it; the flavor combination was already awesome. This was definitely the best cheese pizza I ever had – so good that it allowed me to identify animals by their scientific names. I plowed the whole thing into my face and I was primed to eat my wedge. That was also excellent and came with a side of homemade blue cheese dressing for extra heart attack probability. The meat wedge was slightly spicy, very tasty, and came with an entire peperoncini on top. I dipped the crust into the blue cheese and then into my mouth. It was more dope than a RUN DMC concert in the 80’s. With our food finished, we talked about how great it was. I was shocked. I thought Slab would be a run-of-the-mill pizza place with nothing to offer me. It turns out that the original Sicilian slab is insanely popular for a very good reason – it’s made by the Italian God of pizza. The band was fun, the outdoor area was nice, and the indoor area is great too. Without a doubt, this place will be a go-to year round for a lot of people. Food came to $20 and drinks were $13. Considering the strength of the beers and the size of the food, I thought it was a pretty good deal. I would go back anytime and probably try something different just because I’m really interested in what else they have to offer. Everything we had was extraordinary. I’m not sure Slab is competing with any pizza places because they’re product is totally different than anything else around Portland. We went that day even though we planned to eat pizza at night and it certainly wasn’t a mistake. Slab is going to be around for a long time but you should probably go soon. Very soon. Feel free to email me at peterpeterportlandeater@yahoo.com with any thoughts, suggestions, criticisms, or otherwise helpful info or feel free to post your thoughts below. Also, like the Peterpeterportlandeater page on Facebook. Follow me on Twitter @Portlandeater. Want to be notified whenever Peterpeterportlandeater releases a new blog entry? Of course you do. Subscribe to my blog by clicking the “Follow” button on the right side of this page. Seriously, do it. What are you waiting for? This entry was posted in Portland, ME food on August 3, 2014 by peterpeterportlandeater.